Step inside a world of books. Vintage and modern. Children's and Adult. To young children everything is fascinating. They especially seem to love the hustle and bustle of busy places and I’ve always found that my children are completely mesmerised whenever I take them into London. Cities have so much going on. Much that us adults just take for granted, but through a child’s eyes everything can be new and exciting. In the City is a wonderful way to take a look at all the different things children might find in a city. In the City is actually quite a long book, and as a result goes into quite a bit of depth about all the different things you might see, and hear, in a busy city. There are pages devoted to the buildings you might see, the people you might meet, the animals that call the city home, the different sounds you might hear, the various modes of transport, the food you can eat and the things you can do whilst in the city. The text in the book had loads of prompts in it for you to use to start conversations with your children about what they can see in the pictures. It might be simply counting animals or boats, or maybe asking them about what types of food they like, or what modes of transport they have travelled on. This is particularly brilliant for any adults who are not natural storytellers and find sharing books with their children a bit challenging at times. It’s an excellent way of introducing lots of things that you can talk about with them. The whole book is illustrated by Dominika in a very bold and distinctive fun graphical style. Her illustrations have lots of shapes in them, which may sound like a slightly weird thing to say, but when you look at the pages of the book (or the fab trailer above) you’ll see what I mean. Not everything looks exactly like it might do in real life, but again that is a brilliant conversation starter with the child that you’re sharing a book with. I can also see it as a brilliant way of encouraging a child to recognise shapes and also to draw. If you start them off with some basic shapes like a rectangle or a semi-circle and show them how the book has used some of these shapes to draw a car, a baby’s pram or a playground. Sharing the book with one of my children I loved just how much there was to see and talk about in the illustrations. The bold style of them made them great for attracting children’s attention and both of us felt drawn to point at the pictures with our fingers to point things out to each other or to count things. I liked the fact that In the City doesn’t actually state which city they are talking about. The N29 night bus is a bit of a nod towards London where Dominika lives, but as the book doesn’t focus on any distinctive landmarks it is quite possible to apply it to any city that you child might know, or might be about to visit. 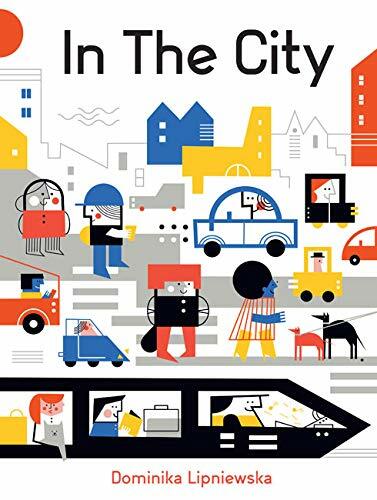 I think it would make a wonderful gift for a young child before a weekend trip to the city and it would be a brilliant conversation starter for talking about what cities are like and all the different and similar things that they might find there. In the City by Dominika Lipniewska is published in Hardback by Button Books in April 2019. ISBN 9781787080300. £12.99. It is aimed at children aged 2 – 5 years. Disclaimer: We were sent a copy of In the City for the purposes of this review. All opinions remain my own. This post contains affiliate links. With eight year old Little Miss C a fully independent reader I’m soon realising two things. Firstly how much I miss sharing books with her. And secondly, just how few children’s classics I’ve actually read. I have to buy (or borrow) books for her at an astounding rate to keep her in reading material and I keep trying to steer her towards classics. Books that I think it will be good for her to read, as well as ones that I think she will enjoy. She has certain favourite authors (Jacqueline Wilson being top of the list!) and it can sometimes be a bit tricky to get her to try someone new. Michael Morpurgo is such an author. Born in St Albans, where LMC goes to school, I’ve always been aware of his books, and his role as the children’s laureate, but I have to admit to having never read a single of them. And nor had LMC. Until last week. I’m obviously very aware of War Horse, and knew that there were several books he wrote set during the war, but beyond that I knew little more. LMC then went to a birthday party last weekend where the children were all given a book as a gift when they left instead of a party bag. 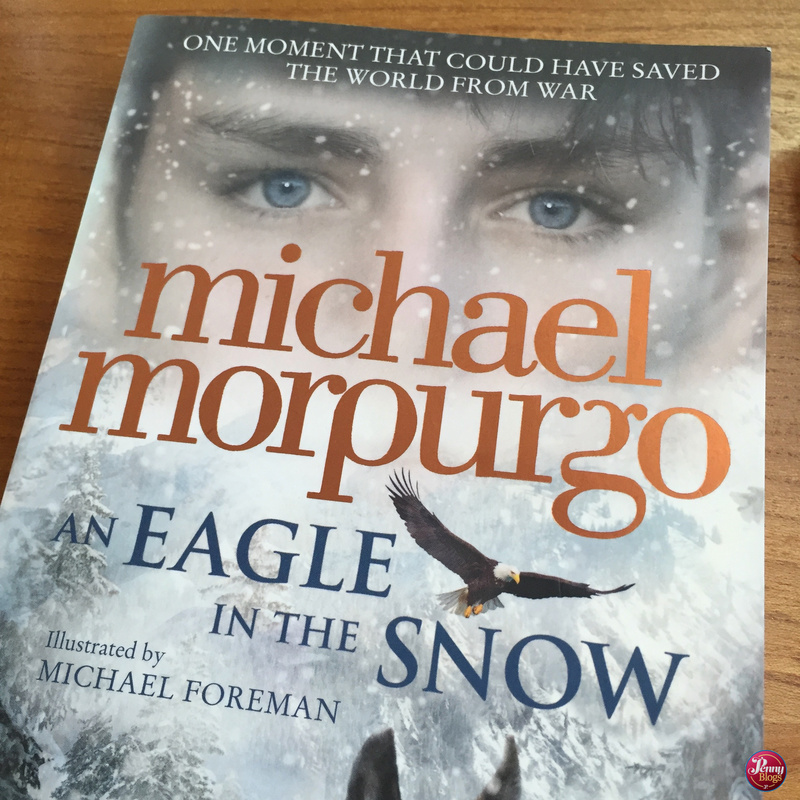 The birthday girl’s favourite author is Michael Morpurgo and so she gave them all one of his paperbacks, and LMC came home with An Eagle in the Snow. With what can only be described as quite an intense and serious looking cover design, I did find myself wondering if she would read the book, as my previous attempts to get her pick up his titles in the library had fallen on deaf ears. Later that afternoon I crashed out in bed for a couple of hours (late pregnancy does that!) and when I got up again and asked her what she’d been up to she happily told me about how she’d started her new book and how fantastic it was. So keen was she to share it that I was then told I had to read the first two chapters that she’d already read whilst she did her maths homework. Not one to disobey orders I did just that, and could see exactly why she had been captivated by it. Set in 1940 An Eagle in the Snow is really a work of historical fiction. I don’t want to give away the whole story, but it is set in a train that is sheltering in a railway tunnel having been under attack from German fighters. In one compartment are Barney and his mother. Escaping from the bombing that has destroyed their home in Coventry they are on their way to Cornwall to stay with an Aunt there. Also on the train is a man. A man who seems to know exactly where Barney is from. A man who has an amazing story to tell. A story about his friend Billy in the first world war trenches. Again, following her instruction, I have curled up and read the book in just a couple of short sittings, and I can fully see why she enjoyed it so much. It’s a great read. It has taught me lots about a story in history that I didn’t previously know about, and also I thoroughly enjoyed getting lost in a book again. Finally though, it’s shown me how lovely it is to share a book with someone, even if you’re not reading it out loud to them. For a while now I’ve been making plans to read all those children’s classics that I never got round to and maybe this is the motivation to do so. Being able to talk to LMC about what she enjoyed most in the book, and how it made her feel has been lovely. Almost like a recollection between the two of us. Replacing something that had been lost when she started wanting to read on her own rather than being read to. It also helps get around the fact that she’s not always staying with me, so I don’t get to sit with her each evening at bedtime and talk about what she’s reading. We FaceTime each night and it’s lovely having books to connect over when we do talk. My challenge now though is to compile a list of the children’s classics that I ought to read and share with her. In a way the hard bit might be trying to narrow it down to a manageable list. I’m hoping I can get through a few of them though during this late pregnancy insomnia that I’m currently battling. It seems children’s fiction is somewhat easier to get through at 3am than some of the adult classics that I’ve been meaning to read for years! If you’ve got any suggestions for books that should be on my list though please do leave me a comment below. An Eagle in the Snow is available to buy online here. Other Michael Morpurgo titles are also available online. On the author’s website there is a very good listing of all his books, split by category, and against each it has a recommended reading age. I’m pretty sure I’m not the only parent out there with a fussy eater. Even if you’re blessed with a child who is prepared to try most things put in front of them, all children still go through phases of refusing to eat something they’ve been given. Even if they ate the same thing happily the day before. That’s what makes Lunch on a Pirate Ship ring so true. Jack is so busy playing with his toys in the garden that he doesn’t hear his mum calling him in for lunch. By the time he makes it to the kitchen his chips were cold and his baked beans had gone hard. He understandably doesn’t want to eat that, so instead turns his imagination to what it might be like to eat with his pirate friends. Here begins his food adventures on the high seas. But he soon learns that life as a pirate isn’t necessarily all that great when it comes to food. Pickled crabs and rotten fish aren’t everyone’s first choice at mealtime, so imagine Jack’s delight when he finds cupcakes, jelly and ice cream. But life’s not as simple as it first looks and Jack and the pirates soon realise that they’ve been lured there by a troll who is planning to eat them all for his lunch! Jack and the pirates return home, realising that mum’s cooking is actually pretty good after all! Lunch on a Pirate Ship has some lovely, fun illustrations from Kristina Stephenson which go alongside the fast-paced rhyming text by Caryl Hart. It’s a brilliant book to read aloud, either at bed time or to a group of children. It’s also perfect for kicking off discussions with children about food and the different things that they like (or hate) to have served up for lunch or tea. 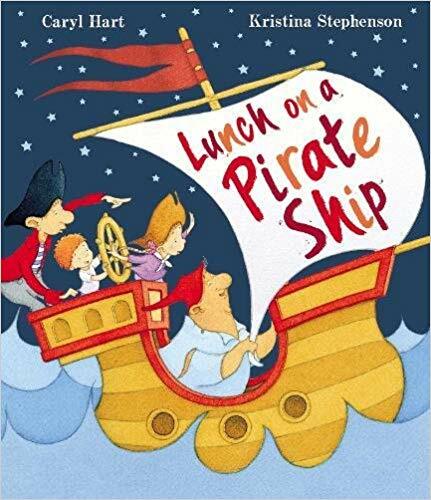 Lunch on a Pirate Ship was published by Simon & Schuster on 5 July 2018. Paperback ISBN 978-0-85707-942-8 Priced at £6.99. It can be bought online via Amazon here. Disclaimer: We were sent a copy of Lunch on a Pirate Ship for the purposes of this review. All opinions remain my own. This post contains affiliate links. As soon as I opened the package containing Tom’s Magnificent Machines I just knew that Master C would be excited by it. He loves making things and has such a brilliant imagination and combined with that a fantastic understanding of how things work. I’m going to start with a warning though. Tom’s Magnificent Machines is one of those pictures books that you read and suddenly find yourself with a lump in your throat and something in your eye. It’s beautifully poignant. Tom lives with his Dad and together they have a pretty special life – sharing a love of making things. Especially things that move. They started simple, but soon moved on to bigger and better inventions which almost took over their house. A house that was full of giggles. Lots and lots of giggles. But then Tom’s Dad lost his job and everything changed. Gone was the funny, smiling dad that he was used to. The machines that they had made together started to gather dust. When he thought that things couldn’t get any worse Tom’s Dad told him that they could no longer afford to live in their home and they were going to have to move house. Tom was heartbroken. He knew that he had to do something. Had to come up with a plan to change things. Luckily after lots and lots of thinking he came up with an idea. Something that would make the most of all the inventions that Tom and his Dad had made and hopefully allow them to stay in their home. He just needed to convince his Dad that his plan was worth trying. Tom’s Magnificent Machines works so perfectly on two totally different levels. 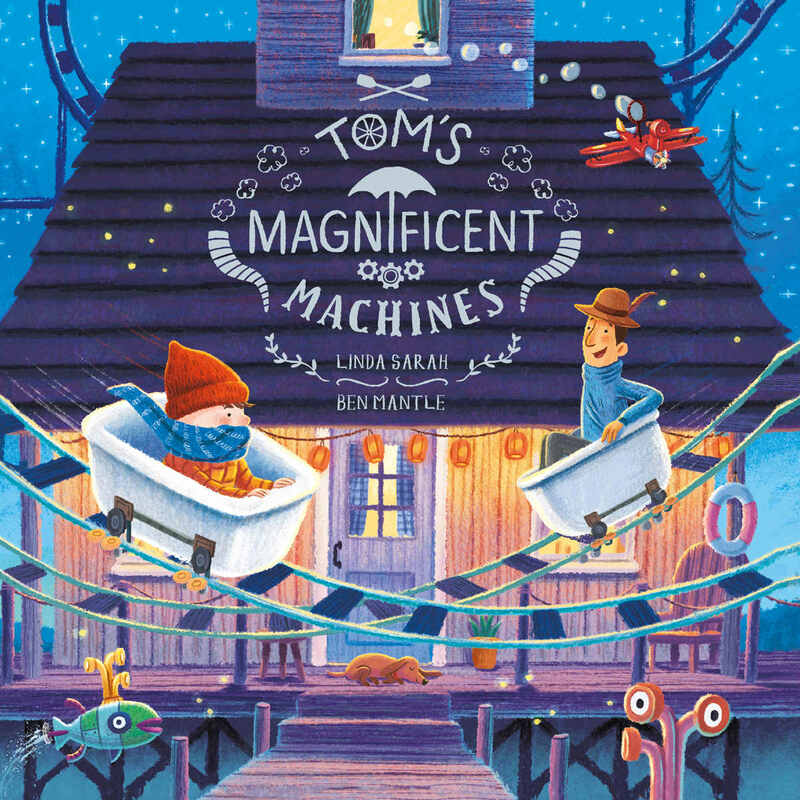 Simplistically there’s the amazing inventions that Tom and his Dad have come up with – and Master C absolutely loved these and the way that they are illustrated by Ben Mantle. On a second level there is the partnership between father and son. The two-way love and support between them. It’s simply beautiful. Even if it did have me reaching for the tissues. Tom’s Magnificent Machines was published by Simon & Schuster on 23 August 2018 Paperback ISBN 978-1-4711-2246-0 Priced at £6.99. Available to buy online here. Disclaimer: We were sent a copy of Tom’s Magnificent Machines for the purposes of this review. All opinions remain my own. This post contains affiliate links. Master C has been a huge fan of Supertato recently, and so it came as no surprise when the first book that he picked out in the latest pile sent from Simon & Schuster was The Night Watch Ninjas. He instantly fell in love with the idea of Stinker the Stink-Meister Smellykins Skunk being on the loose, although to be honest he didn’t really seem that concerned with capturing him. Instead he was just getting excited about how smelly he was. I guess that’s boys for you! The Night Watch Ninjas are concerned though. They make it their mission to capture him, despite the skunk’s best attempt to put them off his scent. Stink Bombs and Smelly Cheese won’t beat the ninjas, although a supermarket full of skunks does slow them down a bit. Luckily they remember their training and try to get inside the mind of their opposition. That’s the best way to success in a situation like this. This is a fantastic, action packed book that Master C absolutely loved. The addition of the membership test for being a member of the Night Watch Ninja Club was a fantastic final part. Master C jumped out of bed and took the test incredibly seriously, jumping around his bedroom like a proper ninja. Well as much as he could in a bedroom that was reading about 28 degrees at the time! He just now wants to know what his first ninja assignment will be. 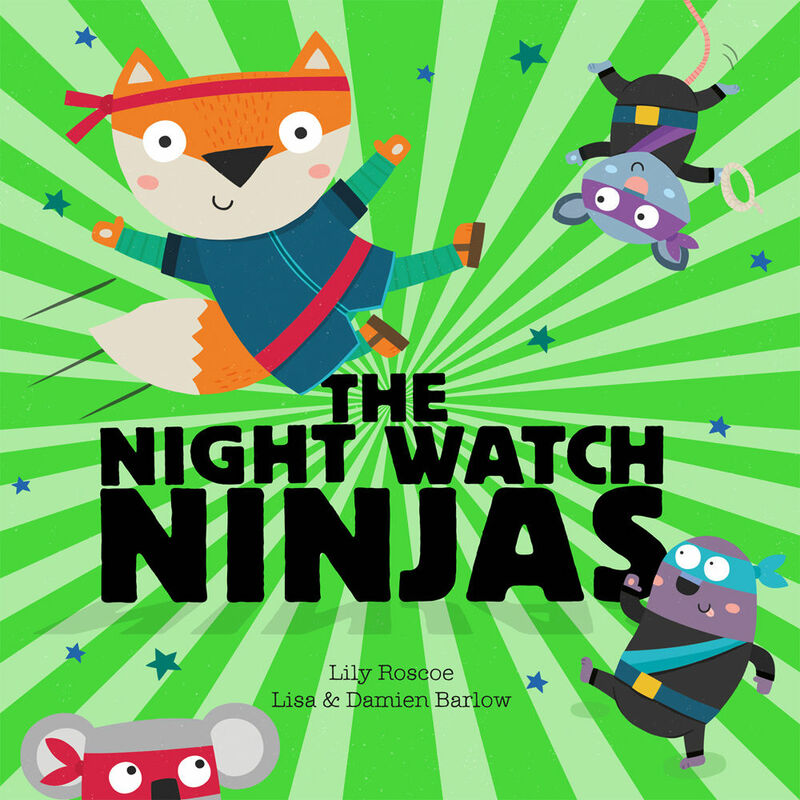 The Night Watch Ninjas is a great book to appeal to children who love a bit of action in their bedtime stories. Lily Roscoe has done a fantastic job in writing a story that really is packed full of action (and smells) and this is accompanied wonderfully by husband and wife team Lisa and Damien Barlow’s great illustrations. Watch out for the Night Watch Ninjas (probably with Master C in tow) keeping your town safe from night-time mischief! The Night Watch Ninjas was published by Simon & Schuster on 12 July 2018. Paperback ISBN 978-1-4711-6467-5 Priced at £6.99. It can be bought online via Amazon here. Disclaimer: We were sent a copy of The Night Watch Ninjas for the purposes of this review. All opinions remain my own. This post contains affiliate links. With the current celebrity version of the Great British Bake Off (The Great Celebrity Bake Off) hitting our screens it’s made me realise that despite the programme’s move to Channel 4 and the loss of Mary Berry, the tent based baking competition doesn’t seem to have lost any of its magic. Kids also seem to completely love the show (even if some of the innuendo does go right over their heads!) 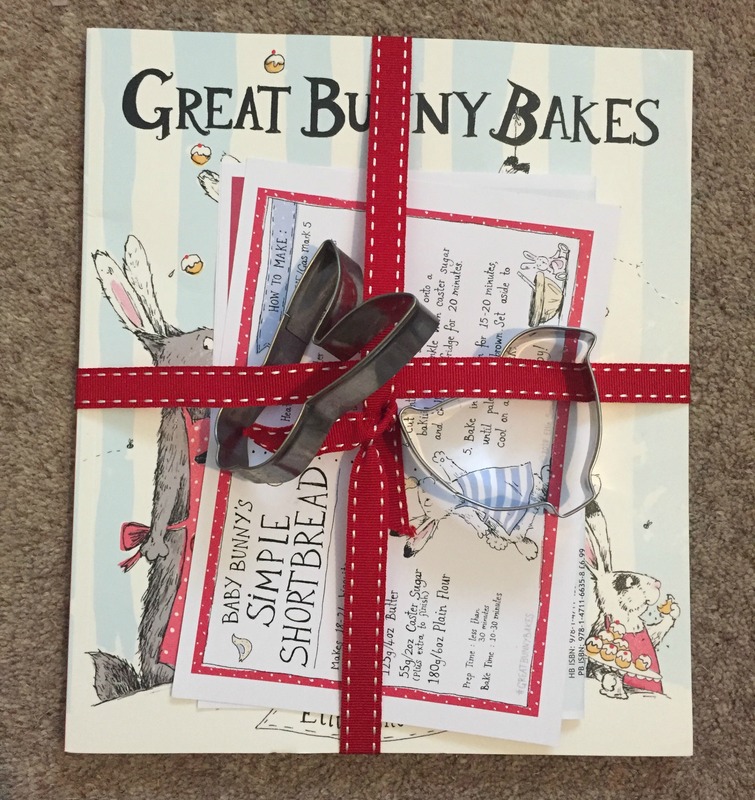 and so Ellie Snowdon’s new book Great Bunny Bakes really captured my children’s imaginations. But any problem can be overcome with a bit of imagination. Oh, and some fancy dress! As if the sugar/salt mix up wasn’t enough, as Quentin goes to carry his chocolate cake to the judging table disaster strikes and he drops it! All is not lost though as it turns out that the other bunnies are more than happy to come together and help their fellow baker in his hour of need. 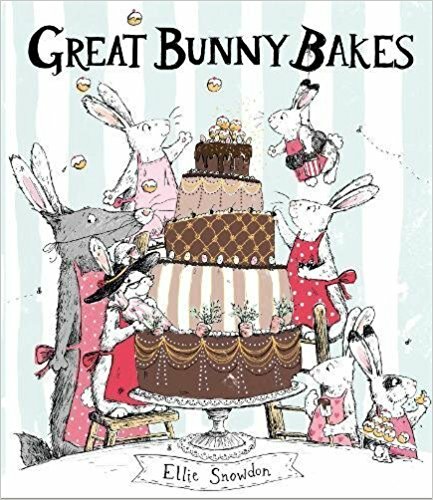 Great Bunny Bakes is a lovely book for any child who enjoys baking and who has maybe enjoyed the Bake Off, or Junior Bake Off, on television. We were lucky enough to be sent a review copy along with a beautiful recipe card and some cookie cutters. Master C was delighted to see these and has specifically asked if he can do some “biscuit making” with me the next weekend we have together. He thoroughly enjoyed the book and loved the baking creations in the accompanying illustrations. They are beautiful busy pictures, with lots of details for children to pick out when you read the story to them. I am slightly worried that Master C might think my baking ability is up to making a honey bun tower like that pictured, but hopefully he’ll be impressed enough with the biscuits that I think I can manage! Disclaimer: We were sent a copy of Great Bunny Bakes for the purposes of this review. All opinions remain my own. This post contains affiliate links.